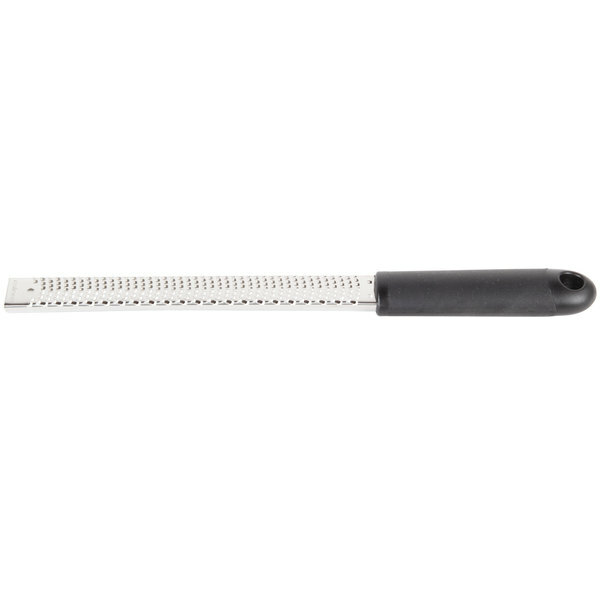 Grate garlic and zest citrus with ease using the fine etched blade grater. Check out this video and watch the fine etched blade grater in action! Add fresh-grated ingredients to all your signature meals using this stainless steel handheld grater! This grater features a corrosion resistant etched stainless steel blade that's sure to provide years of reliable use, while its fine blade pattern makes it perfect for delicately grating cheese to top off salads, chocolate for delectable desserts, and vegetables like garlic and ginger to spice up your main entrees! 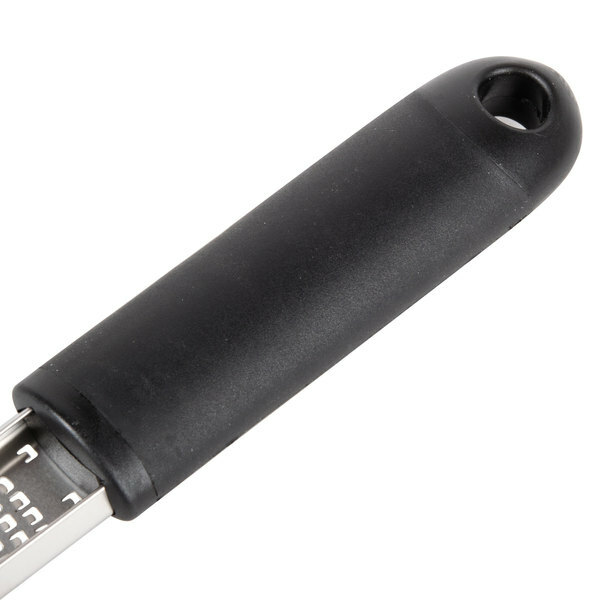 Its black, soft grip handle ensures employee comfort even after long use. I think this grater with a fine blade is probably the hole size people are looking for if they want a zester type grain. It comes with a blade protector, which is nice, and the handle grips well. This grater is good in that it has a long grating side making less work. The downfall is in the shape of it making it sometimes difficult cut. The blades are raised higher than a microplane brand, so they sometimes catch on harder items (e.g., nutmeg). I recommend the grater since you can't argue with the result it produces for the price. 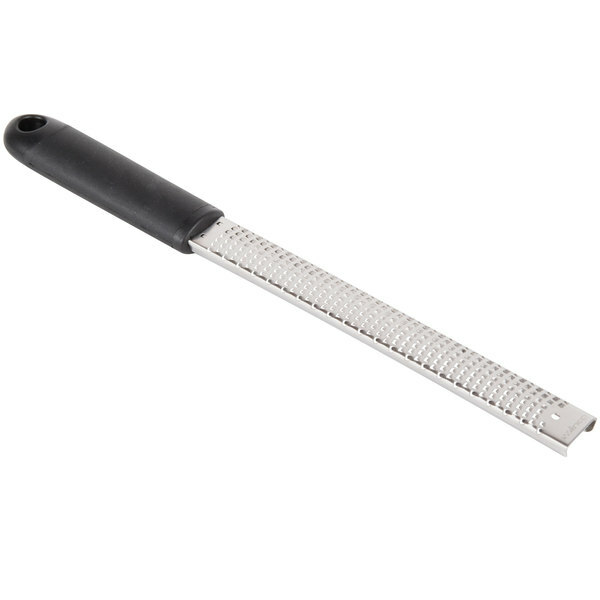 This microplane is great for grating cheese and zesting citrus. It has a sleek look and it is perfect when grating cheese on customer's pasta dishes. The fine teeth allow for a super elegant cheese showering! We use this grater in our wine bar kitchen to grate cheese for panini. It has a sturdy, simple design that is easy to use. The blades are sharp and I think they will be for a long time. The fine blade grater works really well for orange peels, and also for nutmeg. 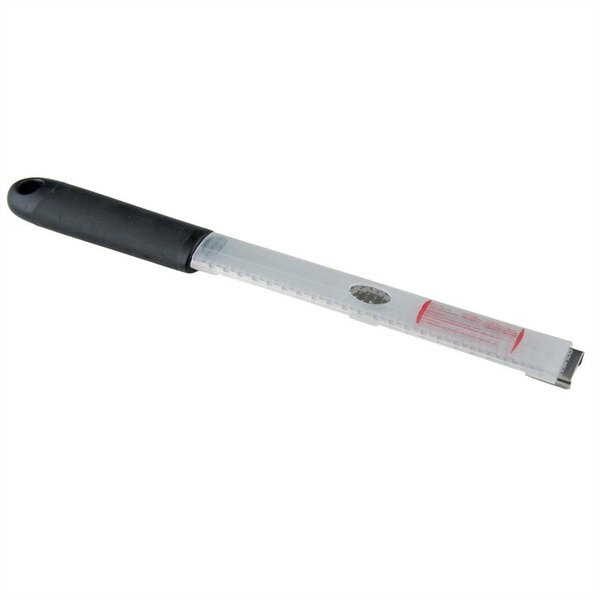 As many have mentioned, they come very sharp, but will dull over time with regular use. I don't think that should be a problem considering the price. I purchased the fine blade grater after I had already purchased the zester. The fine blade is just a tiny bit more fine, and I think it works a little better than the zester does. However, I am really happy with both. Adequate grater which will chunk through large amounts of material quickly. I have found that the blade profile is a bit overly high, tends to really grab material so one should take care to protect your finger tips. Standard microplane. No issues, works as one would expect. Great price. We will be purchasing more and would recommend this to anyone home cook or professional. My partner bought this on a whim and now its the only way I cut garlic. 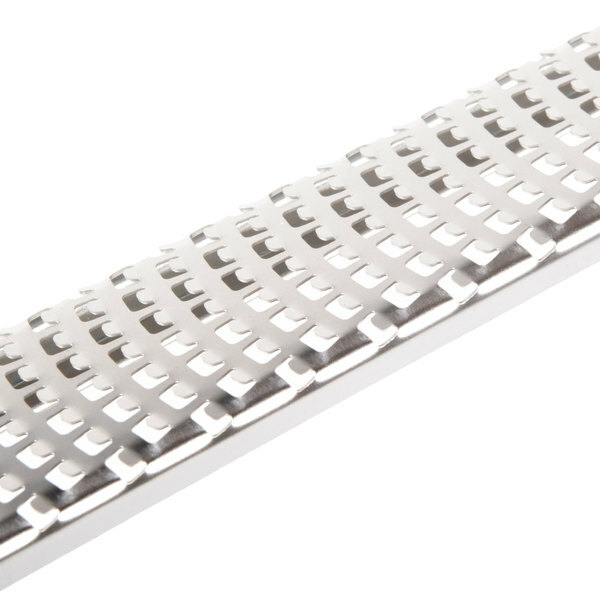 Nice fine grate that also works well for hard cheese and even vegetables for garnish. A little difficult to clean but it works so well you won't care. The teeth on this grater are SHARP. Works perfectly as a zester or for finely shredding harder cheeses like Parmesan. Cleans easily and the blades stay sharp for a long time. Good product. I've buy several different brands of this same product over the years and this one is no different. The blades stay sharp for six's months or so and then become less effective. It never stops working altogether but you can just tell its not as sharp as it once was, which is to be expected. I will continue to buy as old ones fade. It's a nice little grater and a fraction of the cost for a microplane that might be a little more fancy but barely worth it. This fine blade grater is very sharp. 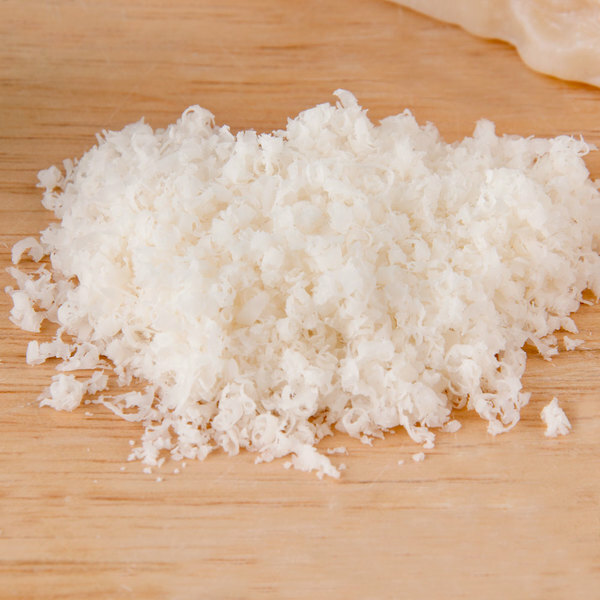 It grates parmesan with ease and is perfect consistency. I have yet to use this for nutmeg, cardamon, or any type of zesing. Though I do think it would work fine for them. This microplane is a mistake have for a professional and personal kitchen. It creates the fluffiest citrus zest that I have ever seen. The comfort grip handle is especially helpful when you a few dozen lemons to zest. This grater is awesome! It is extremely sharp and seems like it will stay that way for a while. It takes a little bit of time to break in because the teeth are raised at an angle that makes it a little difficult to use at first with softer ingredients like limes. A great fine zester tool that is great for shaving chocolate and other items for recipes. The blade is great and makes for a great additon to our prep tools. Fine delicate zests that are impossible to achieve with other graters. 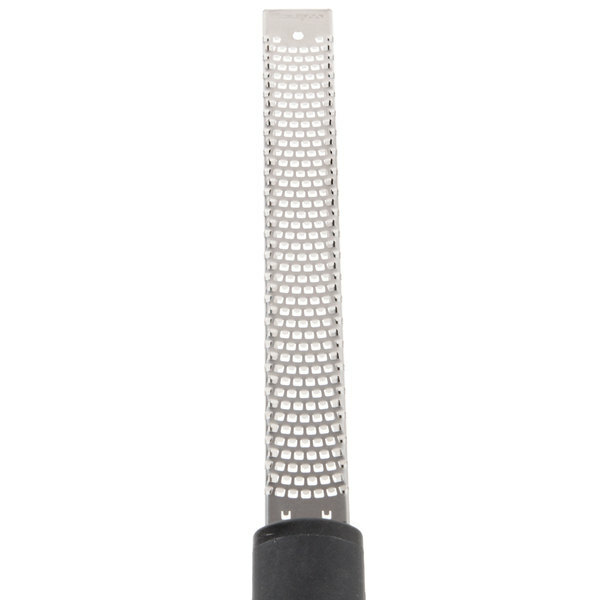 Long blade , sturdy handle and easy clean up make this grater a great option for garnishes. I had my boss order a few of these for the teaching kitchen I run for middle and high schoolers. 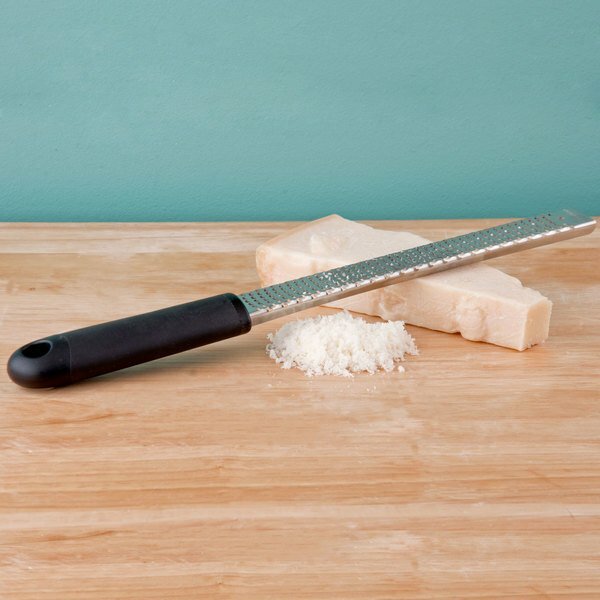 They are perfect for so many things - parmesan, zesting, even the occasional bit of nutmeg. I like my zested better. Works but not as well as I had hoped, I need to experiment more ... washes well in sick and dishwasher. Thank you for your feedback! We are sorry this grater did not meet your expectations. Please contact our Customer Solutions team for recommendations! I like the way this grater is constructed. 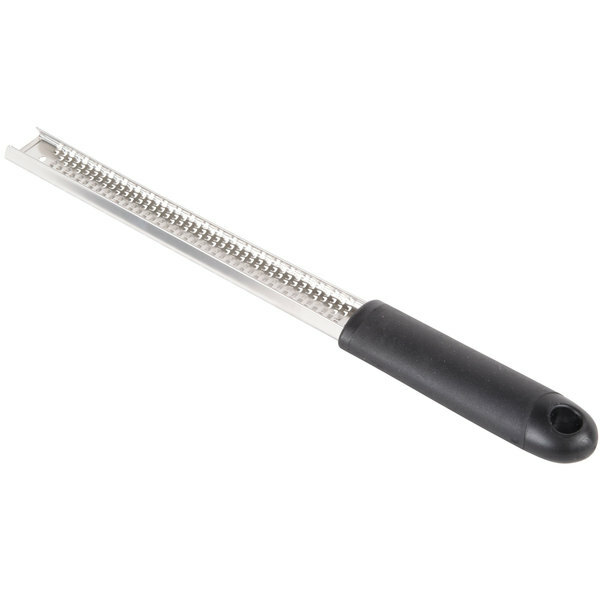 The handle is comfortable to hold, and it makes short work of zesting citrus or even finely grating cheese. Because of the way the blade is folded over, the channels this creates on the back of the blade must be cleaned and dried carefully. Still, this is the best zester I've ever owned, and I'm very happy that I purchased this product.